Will the presentation of this Medallion soften the hearts of Canberra Bean Counters ? Last month I was informed by the Dept of Veteran Affairs that I among many others would be presented with a special medallion which commemorates the 60th anniversary of the end of WW2 in the Pacific, this medallion was to be presented to me by my Federal member of parliament Jill Hall, whom I remember as a helpful and industrious person. The presentation was low key(Save me the detail) . I took notice that about 30% of the recipients were expat Brits who served in the Pacific during WW2, I was photographed together with Jill Hall (MP), I then received a small box containing a gold coloured medallion, it was enscribed - WORLD WAR 2 SERVICE TO AUSTRALIA. inside of the box a message on a small card states: It is presented in 2005 by the Australion govt on behalf of the Australian people to those who served this nation and her allies during the war from 1939 to 1945. 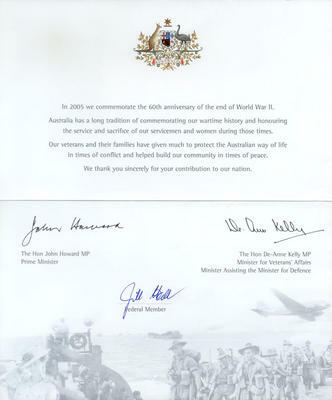 I also received a folded 6x8inch commemoration form With the Australian coat of arms etc, with printed signatures of our Prime Minister John Winston Howard who signed himself John Howard and vet affairs MP De-Anne Kelly, then finaly Jill Halls signature with a real pen, bless her, Well done Jill Hall. 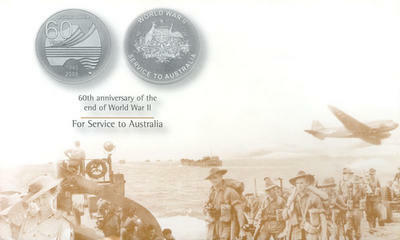 In 2005 we commemorate the 60th anniversary of the end of WW2. the service and sacrifice of our servicemen and women during those times. in times of conflict and helped build our community in times of peace. We thank you sincerely for your contribution to our nation. Well well well!! How would anyone interpret this message other than an admission that us Brits who also did more than our bit, should receive the gold card. Incidently, apart from the official invitation to attend for the presentation, My NAME WAS NOT EVEN PRINTED ON THE DOCUMENT OR INSCRIBED ON THE MEDALLION. The Australian 'GOLD CARD'. The ongoing Gold Card saga plods its weary way through the morass of political discrimination. The first requirement for this elusive 'Gold Card is that, you were born in Australia, or if you migrated to Australia and served in the armed services and faced the enemy in the defence or in the interests of Australia; in or overseas. You dont have to be wounded in action or become the holder of a distinctive decoration, you may be a non combatant in a designated war zone, and of course you must be an Australian citizen at the time of qualification and at the time of the receipt of the award and more than 72 years of age. I am a ex British serviceman who served in the British Navy for nearly four years during WW2, Korea and middle east conflicts. Based in Sydney Australia during WW2, the last nine months was spent at sea in the Pacific serving with Australians and the United States forces until the surrender of Japan. At the end of hostilities, a vast number of British servicemen stayed on in Australia, some illegally I am told, most of whom became Australian citizens, some for nearly sixty years. Myself, well I being a career Navy man, I was unable to return to Australia until 25 years later. My main concern is for those British men who have given their all for this country and consider their home to be Australia, Some of these old guys really need this entitlement as much or in some cases more than some of the healthy looking true blue Dinky di Aussies, maybe its more important that an OZ vet gets a new set of gnashers and a face lift due to the sun than an even older ex Brit guy needing a knee replacement. An Australian friend told me he arrived in New Guinea just as the war ended and had to wait several years to see his first Japanese, A tourist in Sydney, good old Al gets the gold card for that overseas holiday, however, most of those vets who served in New Guinea deserve a heap of respect and much more than a bloody Gold card. I am uncertain as to when this Gold Card was first awarded, however, to my knowledge; it was certanly not around even when I returned to Australia in Aug 1971 and it could not have been one of the many incentives to persuade me to return here. I did not have to rely on charity on my arrival here, my family and I had enough funds to purchase a residence, also a steady income from England, in fact 60% of our income is sourced from the U/K. I have never drawn any Dole payments. FAQ " Why do other commonwealth citizens ie British not recieve the gold card" ? "answer, I believe its just the rules you know". In other words it is blatant discrimination, there can be no possible excuse. The costing would be minimal compared to some of the present governments grants to arts weirdo's and other bludging work shy organizations, unnecessary overseas aid and the constant wasteful updating of those outdated Collins Class Submarines, Or the money could be well spent updating the salaries and pensions of some of our more notable Chicken Hawks who escaped overseas during the time Australia was at war, like Malcolm Frazer who became PM by default, our present PM little John, and of course Billy Bunter- Alex Downer Our Foriegn Minister. The likes of those blokes will have a Gold Card in every pocket. More to come in my next post. VEST DAILY GAGGLE.